I decided to paint the master bath on Saturday while my husband and daughter went to a football game. You can see that I had my sample on the wall. Actually, I've had that sample up since the beginning of August. A good long time to look at it. Because I was soooo tired of all the beige. It worked with the red- except the red in the bedroom is gone. And what spurred on this job? The trashy looking light fixture. It was very nice- except one day I noticed a crack. You can see it on the left there. Upon closer inspection, the whole thing was cracked! I was really worried that the glass globe would just fall off and smack somebody in the head, so I took it off! A painting project from a light fixture that needs to be replaced. Well, that and the master bedroom makeover. I was loving the brightness and lightness of the new color! the ceiling with bright white paint- you can see the major difference already. In the middle of the second coat, I started feeling like this wasn't working. Don't you hate that feeling? Because I was sore, and tired. The colors in the bedroom weren't the same shade of blue. And I knew that would bug me. Plus, the brown tile and the blue just didn't go together. but in the meantime, I knew I couldn't live with this. Benjamin Moore's Indian White, mixed up in Home Depot's Behr paint. I had about a third of a can left, and started cutting in. I liked that the bedroom color was flowing into the bathroom now instead of chopping up the rooms. you can just start to see everything come together more readily? The Indian White goes better with the current tile until we transition to the new stuff. The floors will have the white vintage octagonal tile with a gray or tan grout. I found some white marble tiles that we can put on the countertops and around the tub deck. White beadboard around the tub base. and then a breezy white curtain to top it off. and polished silver light fixtures with frosted white shades. I found the perfect spot for it. On the back wall of my china cabinet. I really like it!! The color makes it so bright and cheery! I liked the color of the blue, but you were right, it didn't quite go with the tile you had. It looks gorgeous in the china cabinet though! Nice job! I LOVE you tub, so jealous!! I hate it when you do all that work and just "feel" that it isn't right. I would love octagonal tiles in my bathroom as well! I liked that blue, but agree that I'm not sure it went with the 2 browns in the tile. I think the color you ended up with really looks nice. You can always add some blue accents if you really want it in there. Nice job! you have been a busy girl...love what you've done to your bathroom. you inspire me! Love it, Denise! I can tell school has started for Hannah! LOL! I think you made a great choice in color and I love the idea of adding the bamboo roll down shade in the bathroom with some white curtains. It is a very clean look! Keep it up! Oh I hate painting...I get SO frustrated! 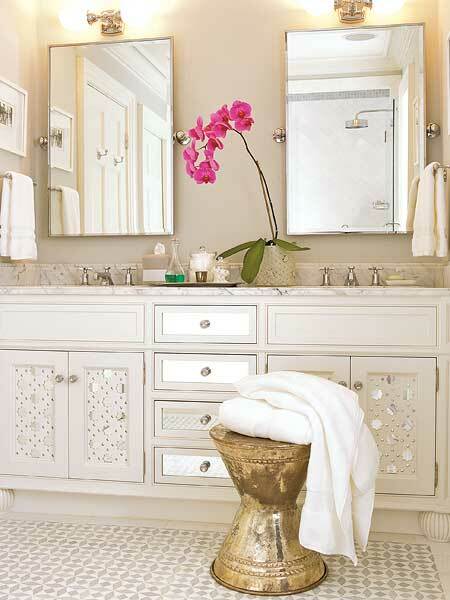 I love how your project all stemmed from a light fixture : ) Your bathroom is looking good!